Days of Blood and Starlight completely repaid me for the huge disappointment I felt following Daughter of Smoke and Bone. I entirely forgive Laini Taylor for the car crash that ended the first instalment of this series, and I want to hug her until I crush her ribs and her lips turn blue for gifting this fabulous sequel to the world. It was everything I hoped would follow Daughter of Smoke and Bone - emotional, heart wrenching, tense as hell, engaging, lively and entirely gripping all led by the brilliant Karou. I heart Karou. I want to invite her round for tea. I'll make cheesecake, I'm good at that. She's just my kind of girl - strong, brave, smart and fierce with integrity. She's a million times more rounded and developed as a character this time. She rings true with every line of dialog. And she's not burdened by an obsession with romance and tru lurve. Yes! So the war between the seraphim and the chimaera has begun and ended, with many, many deaths suffered on both sides of the fight, though none hit harder than the "monsters". The rebel chimaera have retreated to the safety of earth, beneath a portal unknown of to the seraphim. There they pledge to rebuild their army and strike back against their enemy, helped by Karou who has the enormous burden of filling the position of resurrectionist following her revelation of the true nature of Akiva and his people who she is forced to turn her back on. As she and him are reluctantly dragged deeper into their own private wars, they each individually must decide who to trust and learn that sometimes picking a side is not as easy as it initially may seem. The psychology explored in Days of Blood and Starlight is brilliant. Revenge and pride drive people to do terrible things. Is it worth losing your own humanity, becoming the very thing you despise and fight desperately against for vengeance, for tainted victory? Thiago, the white wolf is the personification of this idea. He is foul. I loved him. He's an awesome villain - menacing, controlling and desperately cruel. He reminded me of the sort of guy us ladies are warned against trusting. Handsome and shiny on the outside, blackened and ugly in his heart. I loved his and Karou's interactions. She had the full measure of him, but trod carefully. She used careful cunning and bided her time to eventually trip him up, using his own arrogance as her sharpest weapon against his throat - such an awesome conclusion. I really enjoyed the fact that Karou and Akiva ran separate story lines, it gave great insight into who they both were, particularly Akiva who I felt was just walking muscles and fiery eyes through Daughter of Smoke and Bone. Akiva's motives and history was explored in a lot more depth and his relationship with his siblings was wonderfully portrayed. It was fantastic to read about a relationship not based on lust or personal gain, as too many appear in this genre, but instead a true, deep caring and affection for each other. I know this relationship well. I adore my sisters. I feel for them as if we wear the same skin. We are separated by continents but our hearts are always near. It's so touching to read of a sibling closeness so tender and for me, personally relatable. The pain and confusion Akiva experiences when he is forced to conceal his true feelings towards the war they are all thrust into was heartbreaking. And the ultimate and unending loyalty the brothers and sister showed for each other was just beautiful. I so enjoyed this aspect of Days of Blood and Starlight. There was so much conflict! Not just surrounding the war, but internally within each of the characters. Karou and Akiva both had their own struggles to contend with, and both followed their hearts and vowed to do what was right despite this being the harder path to tread and often at odds with those around them. I loved this! It's so important in life to travel the journey that you, in your heart believe is right. Don't be swayed by the crowd, never let go of your morals and your integrity even though it may look like a much more hazardous route to take. I've never made anything easy for myself. I've had a lot of difficult obstacles to contend with, but a lot of situations I have complicated for myself because I always stand by my principles. I've lost a lot of friends, I've gone through some truly times, but at the end of the day I'll be rewarded by knowing that no matter what happens I've never let myself down, which can be the hardest disappointment to stomach. I think it's all been worth it to know that I've never compromised my integrity. Karou embodies this perfectly. She's trying to keep it all together and to fulfil her duty to her beloved Brimstone, and her people, all the while fighting desperately against the evil Thiago and the knowledge that she is in fact in love with who she believes to be the enemy, despite how hard she tries to deny this fact, her heart knows it's true. Love it! The only reason I'm knocking a star off my rating for this book, is the pacing. It slightly missed the mark for me. It was just a little slow. It's a helluva long book and I feel it could have been shaved down a little if there was less wandering around in contemplation. But oh the feels! And it was all in the details! The heart wrenching details! The world building is simply amazing and every character feels so alive. The details in Karou, in her character growth and shift is accurate and so right after the horrors she has endured. Huh ..... I guess I'm torn then. Yeah, it's slow but it's a good kinda slow. But I stand by my four star rating. 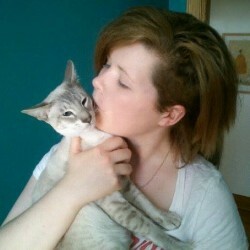 Cos that's just the kind of girl I am. 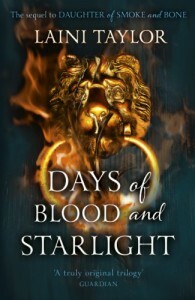 I was really blown away by Days of Blood and Starlight, I never expected it to be this epic, particularly as it is the middle instalment of a trilogy which I always expect to be unsatisfying padding out, a bridge between the opening and the conclusion without much real action. This story is no simple bridge though, unless you were imagining a bridge spanning an active volcano spitting fatally hot lava, the uneven and unnervingly creaking-as-they-rot wooden boards littered with deadly, super poisonous, angry cobras, their fangs gleaming in the flashes of near constant lightening strikes forking horrifyingly from a violent and blackened sky, threatening to burn through the worrying fragile looking ropes securing the heavy bridge to crumbling rocks.Yeah, maybe it's a bridge like that. Read it, love it, enjoy my friends!